We’ve seen some spectacularaction in the CPU space in 2017, with both Intel and AMD whipping out products hitting every price point and market segment in a furious race to outdo each other. That’s what happens when competition is robust. Sadly, the same cannot be said for the GPU technology market. Market leader Nvidia has been sitting pretty with its GeForce 1000 series since the middle of last year, despite perennial underdog AMD’s best efforts. That’s been especially true in India where brand loyalty is high and prices are low. Nvidia hasn’t needed to unleash an all-new architecture or even a minor refresh – all it has done this year is launch a few new variants to widen its lead and to hit AMD at a few strategic price points. The one new card we’ve seen isn’t intended for gamers at all, and is far too expensive to consider. Added to that, there’s been a constant diversion of global GPU shipments out of retail markets and into the hands of cryptocurrency miners. Popular models have been out of stock all over the world, or sold at significant markups, with AMD’s offerings affected worse because of their relative advantage with that specific kind of workload. It really hasn’t been a good year for gamers who need an upgrade. A few months ago, AMD launched its new Radeon RX Vega series, based on a new architecture (also codenamed Vega) that the company had been teasing and previewing for over a year. Vega is meant to be a high-end GPU series, with products for gamers as well as graphics professionals. We’ve finally been able to test a Radeon RX Vega 64 reference card, and we’re hoping it will bring AMD back into the game, but it’s going to take excellent performance as well as pricing. Let’s dive in to see if it delivers. AMD began teasing the Vega generation of GPUs well over a year before the products actually launched. The defining feature of these GPUs is of course the second-generation HBM2 RAM integrated onto the chip package itself. It’s an extremely complex undertaking, but the benefits are drastically improved speed and reduced latency when the GPU needs to access data, which of course means that the GPU is never left waiting. The memory is connected to the GPU over a 2048-bit bus, for a rated bandwidth of 484GBps. 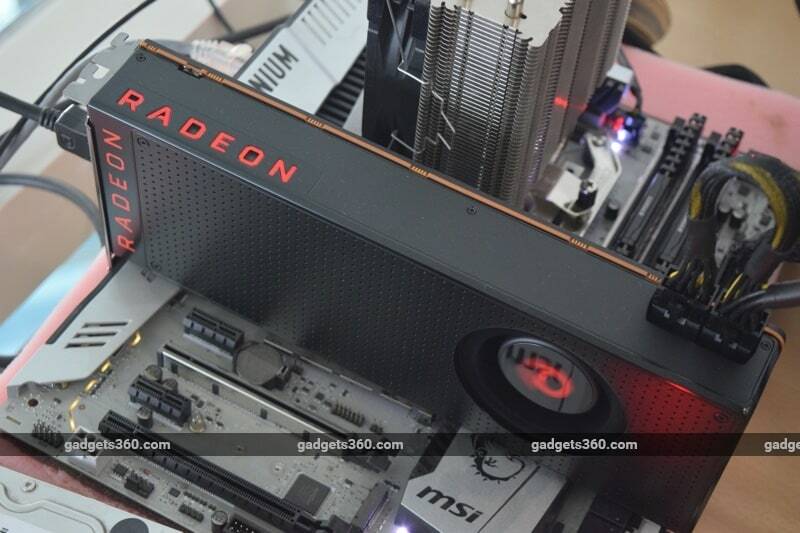 For more about the implementation of HBM, check out our review of the AMD Radeon R9 Fury. 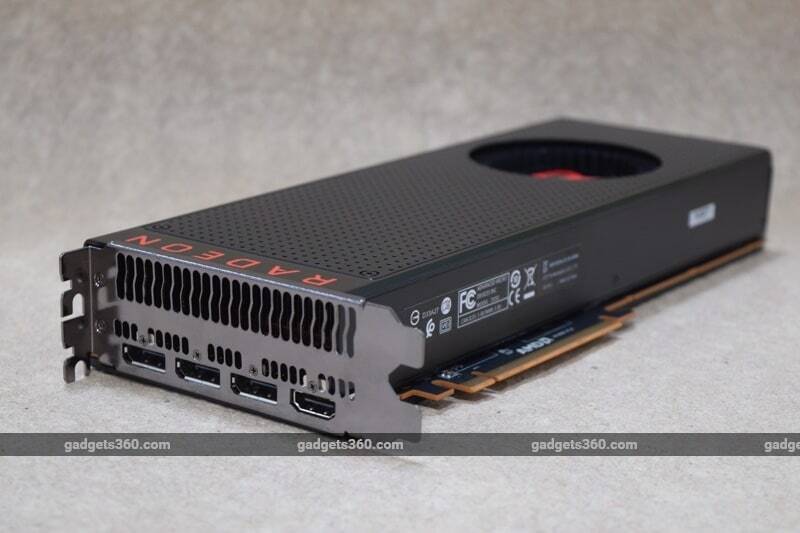 The first-generation Radeon R9 Fury cards were limited to 4GB of HBM, which was a severe handicap in many situations, but AMD has now managed to give the Radeon RX Vega GPUs a healthy 8GB. AMD is also now using its Infinity Fabric interconnect, which debuted with this year’s Ryzen CPUs and also forms the foundation of AMD’s upcoming APUs with integrated Vega graphics. There are two GPUs in the Radeon RX Vega series – the Vega 64 which we’re testing today, and the slightly cut-down Vega 56. The former has 64 of what AMD calls Compute Units, while the Vega 56 as its name suggests, has eight fewer. Each of those units is a cluster of 64 programmable stream processors. The GPU package has a total of 12.5 billion transistors and is fabricated at 14nm. The Radeon RX Vega 64 runs at 1247MHz and can boost up to 1546MHz. One big thing to note about this GPU is its expected power draw of 295W which is excessively high for a consumer graphics card. According to AMD, you’ll need at least a 750W power supply. AMD shipped us a reference model air-cooled Radeon RX Vega 64 graphics card. Although AMD doesn’t sell this card directly in India, it is identical to what you’ll find in the market with Sapphire or MSI branding. It doesn’t look particularly exciting, with the same general cooler design that we saw on the reference Radeon RX 480, except that this card is quite a bit longer. It’s all black with a simple boxy shape and dimpled face; not a patch on Nvidia’s angular silver reference cooler. The shroud is made of metal, but you wouldn’t be able to tell by looking at it, which is a shame. There’s one blower-style fan to push hot air out the back of your PC case, which is good for thermals but bad for noise. The Radeon logo is printed at the end of this card in red, and there’s another one on the side that lights up. You get three DisplayPort 1.4 video outputs and one HDMI 2.0 port, which is now standard for high-end graphics cards. Legacy DVI has been dropped, most likely to make room for a large air vent on the backplate. You’ll need two 8-pin PCIe power connectors, which means that this card needs a lot of power. On the back of the card, just below the power connectors, is a row of eight LEDs. AMD calls this GPUTach, and it shows you how much load the GPU is under at any given point. The strip is positioned so as to be visible through the side of a windowed PC case, and gamers should get a kick out of seeing them light up like an old-style VU meter – or a tachometer, as the name suggests. You can choose between red and blue lighting to match your case interiors, and of course we chose the signature Radeon red. You can also turn the LEDs off entirely if you prefer. As far as this reference design goes, the only thing that individual partner brands can do is change the sticker on the centre of the fan. The Radeon RX Vega 56 and Vega 64 look very similar, but you might also be able to buy a Limited Edition version of the latter which has a much slicker silver cooler shroud with a brushed metal finish. 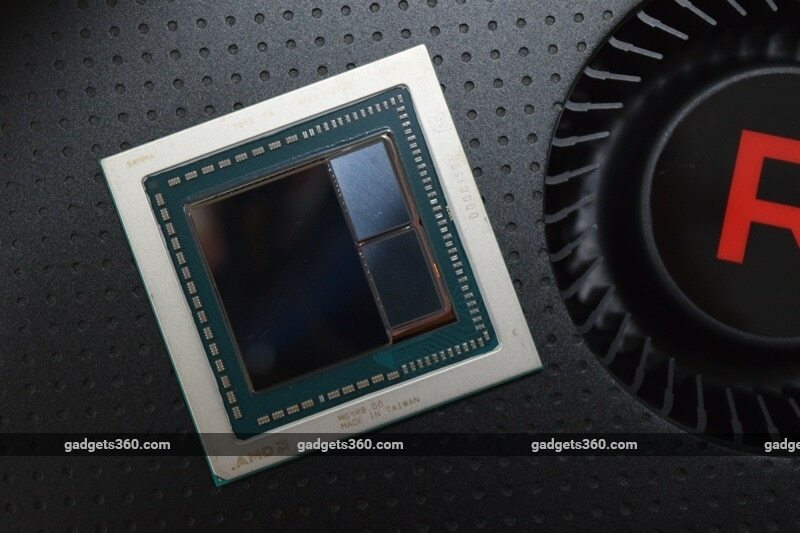 At the time of the RX Vega series launch, this variant was only supposed to be available as part of a more expensive bundle, but some current online retail listings show it being sold in India for slightly less. Based on looks alone, we’d choose the Limited Edition any day. We also hope to see cards with custom coolers from a larger number of AMD partners hit the market soon. There’s also a much more expensive Liquid Cooled Edition which has a factory-fitted 120mm closed-loop liquid cooler and the same silver shroud. It’s clocked higher, at 1406MHz and 1677MHz for the base and boost speeds respectively, but has an even more absurd 345W power rating and you’ll need at least a 1000W power supply. The first thing we had to do in order to test the Radeon RX Vega 64 was upgrade the power supply on our test bench thanks to the eyebrow-raising 750W minimum that AMD requires for a system running one of these cards. Antec was kind enough to step in and supply an 850W HCG-850M unit, which is a fully modular power supply in its High Current Gamer series. It has all the power we need (plus some neat white fan LEDs) and ran perfectly well through the duration of our tests. The rest of our rig consisted of standard components that have served us well through previous reviews, including that of the Asus ROG Strix Radeon RX 580 8GB OC. We used AMD’s recently released Adrenalin Edition driver, and we didn’t enable Radeon Chill or any other efficiency-related tweak that could impact performance scores. First up are the classic 3DMark Fire Strike and Time Spy tests which hammer the GPU with a consistent workload that can be replicated and thus compared across different products. We got scores of 15,689, 9531, and 5310 respectively in the Fire Strike standard, Extreme, and Ultra tests, and 6,575 in the DX12 Time Spy test. We can immediately increases of 50 percent or more compared to the Radeon RX 580, putting the Vega 64 at roughly the same level as the GeForce GTX 1080 and considerably behind the GeForce GTX 1080 Ti. Unigine Valley gave us a buttery smooth average of 74.1fps running at 1920×1080 with 8xAA using the Ultra quality preset. With the resolution bumped up to 2560×1440, the score dropped to 47.8fps and there was slight visible tearing on screen. Ashes of the Singularity repeatedly crashed on startup, so we couldn’t get our usual numbers out of it. We also ran the synthetic benchmark built in to Metro: Last Light Redux, which gave us a surprising 110.2fps at 2560×1440 using the High preset with SSAA off. Turning SSAA on with all other settings unchanged pulled the framerate down to 64.9fps. If you want to push 4K, you’re going to have to dial down the quality settings, and in our opinion, the tradeoff isn’t worth it. GTA V has an extremely thorough built-in benchmark, and playing it manually is a great way to stress any hardware. We started out at 2560×1440 with FXAA enabled and found gameplay to be perfectly smooth. We analysed the frame-by-frame output with FRAPS and found that frames were delivered consistently, averaging 93fps. Except for one section, we were able to stay well below the 16.7ms threshold for smooth 60fps gaming throughout. Raising the resolution to 4K didn’t cause too much of a problem, and we still got an average of 79fps. Rise of the Tomb Raider running at 4K with FXAA enabled gave us 49.75fps using its Very High preset and 40.36fps using the High preset, but in both cases the minimum frame rates fell to well below 30fps and there was quite a bit of tearing. We stepped down to 2560×1440 and got much better scores of 74.84fps and 61.81 respectively, though minimums were still a bit too low for our liking at Very High. Wolfenstein II: The New Colossus is a new addition to our test suite, and it was a lot of fun to run though the first few levels. We used the in-game performance tool as well as the new Radeon Settings overlay to monitor frame rates. Starting at 4K with the top-end Mein Leben! quality profile, we were able to get between 40 and 60fps on average, and never had any reason to drop below that. This game is based on the same engine as Doom, which is well known for running brilliantly on all kinds of hardware. Next up was one of our more demanding games, The Witcher 3: Wild Hunt. With the resolution set to 2560×1440 and both game quality and postprocessing set to High, we were able to average an impressive 72fps. There were minute stutters throughout, but not enough to make us need to turn the settings down. At 4K, the average dropped to 38fps which we found to be too jittery. The last of our games was the old classic Far Cry 4. We can run around, drive, hang glide, and blow all sorts of things up to see how a GPU can handle all kinds of action. Using the Very High preset at 2560×1440, we averaged 86fps but there were quite a few dips below 60fps along the way. Overall, gameplay was smooth and enjoyable throughout. We then pushed the quality up to Ultra and the resolution to 4K just to stress out the RX Vega 64, but it still managed an average of 52fps with fairly consistent frame delivery. It seems that the Radeon RX Vega 64 is perfectly well suited to gaming at 2560×1440, and you’ll be able to go up to 4K in many games. However, there’s much more to a graphics card’s performance than just its ability to push frames out. In testing, we found that our Radeon RX Vega 64 reference card ran extremely hot and loud. The blower fan makes a tremendous noise when the GPU is stressed, and there’s an occasional high-pitched whine as well. It’s especially noticeable when the fan is spinning up or down. Blasts of hot air can be felt several feet away from the rear vents when the fan is running at full speed. All of this is quite distracting in games, and unsuitable for quiet environments. It also made us wary of overclocking the GPU which would only stress it out more. The Radeon RX Vega series represents a fantastic technological achievement for AMD, and we’re happy to see work on HBM continue. A lot of games run very well, and buyers who don’t mind the heat and noise have a workable alternative to Nvidia’s lineup. There’s also the appeal of AMD’s driver and software-level features such as Freesync and Radeon Chill. Hopefully, there’s still a lot of potential to be tapped from this architecture and its successors, and we keep rooting for AMD to whip up something that really scares Nvidia next year, simply because competition is always better for buyers. For now though, this particular graphics card falls short in some ways. 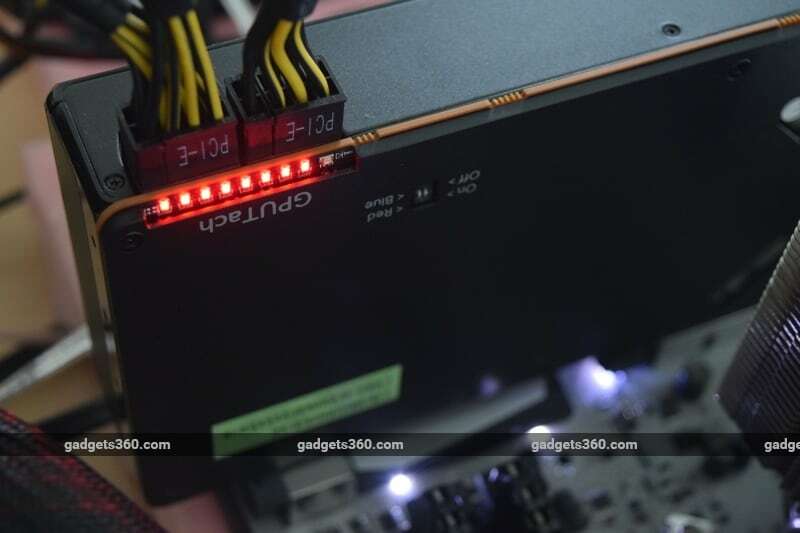 You might not consider power consumption a huge factor when buying a graphics card, but it’s hard to ignore how much more refined GeForce GTX 1080 and GTX 1070 cards are, even the reference Founders’ Editions which have similar blower-style coolers. The fact that this GPU requires a whopping 295W of power compared to 180W for a GeForce GTX 1080 is quite telling. Maybe third-party Radeon RX Vega cards with custom multi-fan coolers could fare better in terms of heat and noise, but you can’t reduce power consumption without throttling performance, and they’re nowhere to be seen in the market as of now. Finally, we have to take a look at prices. AMD has historically had a hard time matching Nvidia’s prices in India, and global supply issues have only added to the problem. AMD’s official India pricing is Rs. 39,990 plus taxes, but the ground reality is a far cry from that. The relatively paltry number of RX Vega 64 models in the market right now are clustered at around Rs. 54,000, while their prime competition, the much larger variety of GeForce GTX 1080 cards, are priced as low as Rs. 42,000. In fact, you could pick up a far superior GeForce GTX 1080 Ti for under Rs. 55,000 which makes the RX Vega 64 look like a particularly poor choice. That’s not even factoring in the cost of a new high-end power supply, which a lot of people would need in order to use one of these cards. It’s now up to AMD’s partners to introduce Radeon RX Vega cards with better coolers and lower prices. If that happens, we’ll happily revisit our verdict. For now though, unless you’re a die-hard AMD fan or have already invested in a Freesync monitor, we’d avoid the reference cards altogether.